Now that we’ve put the Halloween costumes away for another year, it’s time to break out the holiday lights and candy canes. Christmas, Hanukkah, and New Year’s Eve is just around the corner. It’s time to start making lists, checking them twice, and sitting down in front of the fireplace to watch some classic holiday movies. 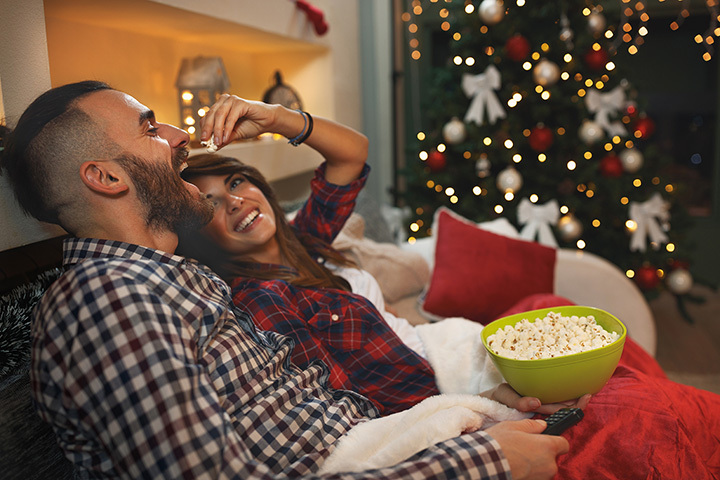 There are hundreds of movies on television during the holiday season. Just turn on the TV and you’ll probably find one within a few clicks, but there are only a handful that one can watch over and over again every year. So, grab a steaming cup of hot cocoa and snuggle up with your family to watch a few of the best holiday movies of all time. You won’t be saying “Ba Humbug” this year. You can’t miss A Christmas Story on TV. With TBS showing the popular movie for 24 hours on Christmas Day, there is no question why A Christmas Story is a favorite for many people. You don’t want to miss Ralphie’s humorous wintry exploits of avoiding bullies, dreaming of his ideal Christmas gift, and wearing the bunny suit his crazy aunt gifted him. And, don’t forget the famous leg lamp! Miracle on 34th Street is a classic among holiday films. In this 1947 Christmas classic, an old man by the name of Kris Kringle fills in as the Santa Claus during the annual Macy’s Thanksgiving Day parade in NYC. Quickly becoming a fan favorite, Kringle starts to regularly appear at Macy’s and soon claims to be the real Santa Claus. Unfortunately, many people believe that Kringle suffers from a mental illness and begin to question his authenticity. Watch the movie to find out if Kringle is the real Santa Claus. Arguably one of the best holiday movies of all time, It’s A Wonderful Life stars James Stewart as George Bailey in this 1946 classic. On Christmas Eve a depressed George wishes that he had never been born. To make his dream come true, an angel is sent to Earth, but George soon realizes how many lives he has impacted and how the world would be very different if he was never there. This black and white movie will leave you in tears and a remind you of the true Christmas spirit. It doesn’t matter if you are a Will Ferrell fan or not, you will probably love Elf. Buddy, played by Ferrell, is a human accidently transported to the North Pole as a toddler who is adopted and raised among Santa’s elves. One day, Buddy travels to New York City to search for his real father, a cranky business man. Follow along with Buddy’s increasingly-chaotic choices as he experiences the human world for the first time. Over the years, The Christmas Carol has been turned into numerous movies, but none are like the Muppet Christmas Carol. During the 1990s, the Muppets were a huge hit and no one was surprised when the Muppets performed the classic Dickens holiday tale. If you’re a fan of Kermit the Frog, Miss Piggy, Gonzo, and the other Muppets, you don’t want to miss this spin on the classic Christmas story. While not a true holiday film, how can you not love Bridget Jones’ Diary? Bridget begins the movie by making several New Year’s resolutions in her diary. The movie follows along her journey in achieving these resolutions and she even meets her love interest at an ugly Christmas sweater party. I’m sure many of us can relate to this classic comedy as the holidays approach. You probably know the song, but have you seen this classic 1969 movie? A discarded magic top hat brings a snowman to life for the children who made him. Everything is good until Professor Hinkle wants his hat back leaving Frosty to either melt or no longer be a jolly soul. Frosty hops a train to the North Pole to survive. The kids will love this classic cartoon. This Thanksgiving movie is all about holiday travel. For those of you who travel home for the holidays, you will relate to this 1987 comedy starring Steve Martin and John Candy. Neal Page, played by Martin, is traveling home to Chicago to spend Thanksgiving with his family when his flight is rerouted to Kansas because of a freak snowstorm. In order to get home in time, he must partner with talkative Del Griffith (John Candy) who Page can’t stand. Will they make it home in time? Based on the beloved children’s book of the same name, this 2004 animated movie became an instant hit. Perfect for the whole family, Tom Hanks and Robert Zemeckis bring this classic Christmas story to life. Follow along as a doubting young boy takes the Polar Express to the North Pole to search for Santa Claus. Whether you watch the classic 1966 cartoon or the more recent 2000 movie starring Jim Carrey, Dr. Suess’ How the Grinch Stole Christmas is a classic Christmas movie. Discover how the Grinch, who hates Christmas and steals everything in Whoville, eventually understands the true meaning of the holiday and returns everything back to the townspeople. After bratty Kevin McCallister misbehaves the night before a family trip to Paris over the holidays, his mother makes him sleep in the attic. The next morning Kevin awakes to an empty house as his family mistakenly leaves for the airport without him. An excited Kevin enjoys his new-found freedom until two con men plan to rob his home. Watch Kevin as he outsmarts the bad men during Christmas break. Airing at least twice every December on ABC, the 1965 A Charlie Brown Christmas is a classic Christmas cartoon for the whole family. As the holidays approach, Charlie finds himself slightly depressed. His friend, Lucy, suggests that Charlie directs the Christmas play where he is both ignored and mocked by his friends. This classic special touches on the over-commercialization and secularism of the Christmas holiday and aims to remind viewers of the true meaning of Christmas. Everyone loves a feel-good holiday love story. Love Actually follows the stories of nine couples who fall in love over the holidays. This star-studded holiday movie will leave you in tears. Follow along as David (Hugh Grant), the newly elected British prime minister, falls in love with a young staffer, and as Sam (Thomas Sangster) falls in puppy love with his American classmate who is returning back to the U.S.
Don’t miss this slap-stick comedy that all too many of us can relate to during the holiday season. Clark Grisworld, played by the humorous Chevy Chase, wants to have the perfect family Christmas at home. As he tried to create the perfect tree and house decorations, things begin to go awry quickly. Laugh along with this classic Christmas comedy with the whole family. You probably know Adam Sandler’s Hanukkah songs, but did you know that he created and starred in an adult animated musical comedy? Davey Stone, played by Sandler, is a 33-year old former basketball star who becomes a petty criminal. To avoid jail time, a judge sentences Stone to serve as the assistant referee for a youth basketball league. In a sea of Christmas movies, Eight Crazy Nights focuses on Jewish characters during the Hanukkah season. There is no shortage of holiday movies that will be on television this holiday season. Whether you like comedy, drama, or family-friendly cartoons, it’s time to sit down around the TV for a little holiday cheer.